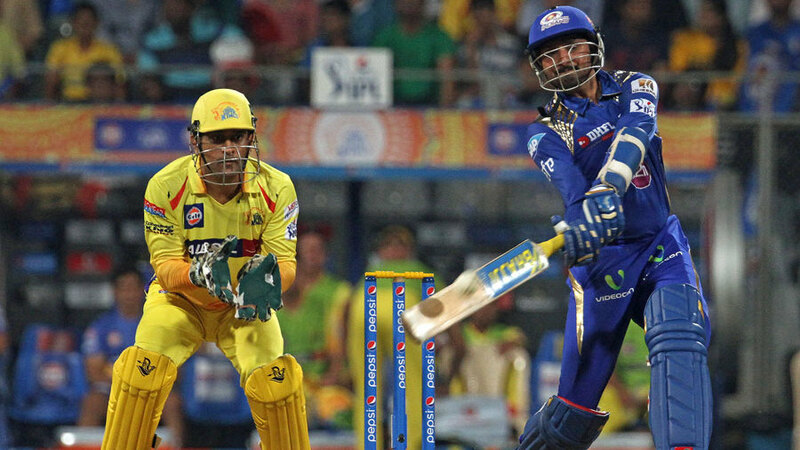 Mumbai Indians vs Chennai Super Kings Highlights - IPL 2015 - 17th March. MI vs CSK 12th match Pepsi IPL Indian Premier League Cricket Highlights at Mumbai. Pepsi IPL Cricket Highlights. Mumbai Squad: Lendl Simmons, Rohit Sharma(c), Parthiv Patel(w), Unmukt Chand, Corey Anderson, Kieron Pollard, Jagadeesha Suchith, Harbhajan Singh, Vinay Kumar, Lasith Malinga, Pawan Suyal, Shreyas Gopal, Ambati Rayudu, Aditya Tare, Jasprit Bumrah, Marchant de Lange, Pragyan Ojha, Mitchell McClenaghan, Abhimanyu Mithun, Aiden Blizzard, Akshay Wakhare, Nitish Rana, Siddhesh Lad, Hardik Pandya. CSK Squad: Brendon McCullum, Dwayne Smith, Suresh Raina, Faf du Plessis, Ravindra Jadeja, MS Dhoni(c/w), Dwayne Bravo, Ravichandran Ashwin, Ashish Nehra, Mohit Sharma, Ishwar Pandey, Baba Aparajith, Matt Henry, Mithun Manhas, Pawan Negi, Samuel Badree, Ronit More, Michael Hussey, Rahul Sharma, Kyle Abbott, Ankush Bains, Irfan Pathan, Pratyush Singh, Andrew Tye, Eklavya Dwivedi.